This is the left panel of a diptych by both Tamikuni (多美国) and Ashiyuki (rare). 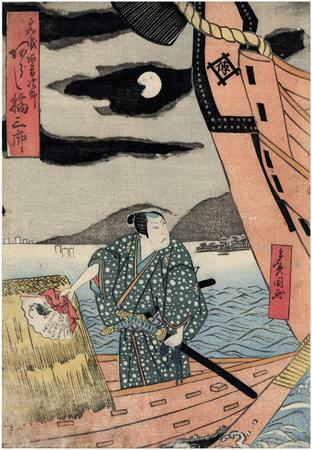 The Ashiyuki panel on the right - not shown here - depicts Arashi Tomisaburō as young woman Miyuki standing on the large boat looking down on Miyagi Asojirō. "Asojirō and Miyuki are characters from the play Shō utushi Asagao nikki (Diary of Asagao) that debuted in 1832 a the Takemoto Theatre in Osaka. The first kabuki performance took place in Edo's Ichimura Theatre in 1848. One warm summer evening, Miyuki, the daughter of a high-ranking samurai, goes out with her mother on a pleasure boat to catch fireflies. The boat is anchored in the stream when suddenly a gust of wind blows away Miyuki's veil. Fortunately it lands in another boat owned by a handsome young man named Miyagi Asojirō. When he returns the veil, the two youngsters glance at each other and fall in love on the spot. To commemorate the meeting Asojirō writes a verse on Miyuki's fan. Some months later they happen to meet again and, as they part, Miyuki throws the fan with the verse to Asojirō as a keepsake of her love for him. Back home Miyuki continually dreams of Asojirō and, not hearing from him, weeps all day. Seeking to end this sad situation, her father announces that he has had a flattering proposal from the adopted son a friend for her hand. In her despair she decides to run away to look for Asojirō. She changes her name to Asagao ('Morning Glory') and weeps so bitterly that she becomes blind and has to make a meagre living by singing. Unfortunately, her father had not told her tha the young suitor, Komazawa Jirozaemon, was actually named Miyagi Asojirō before he was adopted. Much later, by sheer luck, Asojirō and Asagao meet again in the Ebisuya inn at Shimada. Asojirō notices a screen bearing the verse he wrote for Miyuki and when the innkeeper summons her, Asojirō at once recognizes Asagao as Miyuki. He learns of her sad story when she plays the koto and sings her 'Morning Glory' song. Since he must urgently move on, he leaves an explanation, some money, and special medicine to cure her blindness with the innkeeper. When Miyuki learns the truth, she runs from the inn towards the Ōi River and when the bearers refuse to carry her across the river because it is too rough, she decides to commit suicide. Before she can fulfill her plan, the innkeeper, Tokuemon (in reality her father) and Sekisuke, a retainer of her father, arrive. Sekisuke promises to help her find Asojirō and Tokimune plunges Sekisuke's dagger into his side to provide the fresh blood that, in combination with the medicine, is required to cure Miyuki of her blindness."